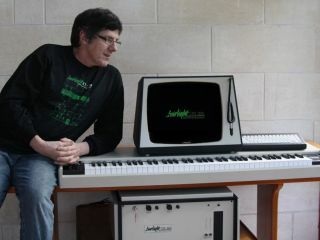 Peter Vogel, the 'father of the Fairlight', shows off his new baby. NAMM 2011: Fairlight's CMI sampling synthesizer was one of the most influential instruments of the '80s. It was used by the likes of Peter Gabriel, Kate Bush, Jean-Michel Jarre, Stevie Wonder and Herbie Hancock, and paved the way for samplers as we know them. Now, somewhat remarkably, it's back. NAMM 2011 will witness the launch of the prototype of the Fairlight CMI-30A, a new version of the CMI that emulates the original's look and feel. This was first announced in 2009. Promising to eschew a precise, sterile sound and instead offer something genuinely distinctive, the CMI-30A comes with a 'goodness control' that enables you to adjust the output in real-time. "Turn it up to 11 and it sounds more Fairlight than Fairlight," says the promotional blurb. The new model emulates the Series II and Series III CMIs, even down to the fact that interaction is via a light pen and monochrome screen. While there's certainly something romantic about this announcement, anyone who wants to join Fairlight on its trip down memory lane is going to have to pay a hefty price: $20,000. The CMI-30A is going into production, though; in fact, orders are already being taken. The CMI-30A is unique in that it offers the classic Fairlight sound that defined music of the eighties, as well as the modern Fairlight sound - that of uncompromising signal purity. Both these extremes are made possible by the extraordinary processing power of the Crystal Core engine which lies at the heart of the system. The Crystal Core media processor (CC-1) was developed by Fairlight.AU as the engine for its range of high-end digital audio workstations. The CC-1 uses FGPA (fieldprogrammable gate array) to achieve performance far in excess of what can be achieved using even the fastest digital signal processor of conventional design. The original Fairlight CMIs were renowned not only for their superb sound quality, but also their elegant and intuitive software. The CMI-30A combines the very best features of the Fairlight series IIX and the III, with significant new developments. Sound quality is continuously variable using the unique "goodness" control which spans from Series I, II, or III quality to "best possible" 36-bit floating point. The base 30A system offers 24 tracks and channels,which will be optionally expandable to 200 (details to be confirmed). Software upgrades will also be available to provide full post-production, mixing and recording functionality. Software functionality is being finalised at the time of publication. Please refer to www.fairlightinstruments.com.au for updates as development continues towards the release version.